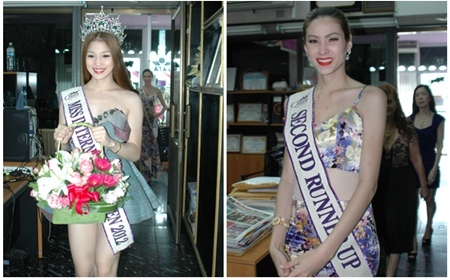 The three beauty queens visit to say thanks to Pattaya Mail. 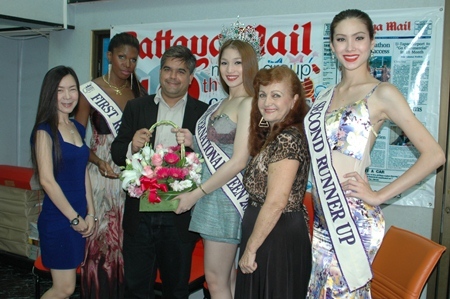 Balot and runners-up Simoes from Brazil and Thailand’s Panvilas Mongkol called on Pattaya Mail Publishing Co. Nov. 9 to thank the management for their sponsorship of the pageant. In interviews, all three beauty queens said that the contest illustrates the problems transgenders have to overcome and raises awareness amongst “normal” people about their struggles. Of the three, only the Thai contestant, who also won the Miss Tiffany Universe title and finished third in the international competition, has undergone gender-altering surgery. Balot and Simoes remain male, at least in anatomy, if not in name as well. Balot said he has no plans to change “Kevin,” to a female moniker. Balot, who even at close range appears very feminine, said he entered the pageant “only for fun” and never believed he’d be the first Filipino to win a Miss International Queen title. Third-place finisher Panvilas, who won the Miss Tiffany Universe title earlier this year, said she was proud to make the final 10 at the international pageant. She said she never expected to win, given that Thailand took the title last year. Panvilas described the preparation for the contest, choosing the meklha dance for the talent competition and the Nang Visakha dress for national costume. The main problem she said she faced was language.